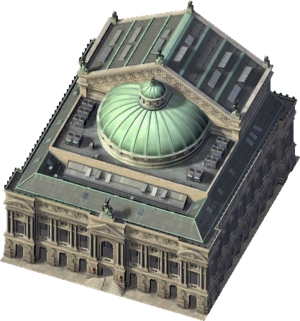 The Opera House is a Civic Building that provides Education to your Sims. Schools are designed to greatly increase the Education Quotient of your Sims, however it only has an effect on a small age group. With the Opera House, the average household age must be 80 Years old to have any benefit at all. Major Art Museum has been built in that city. Its' low capacity, unadjustable funding (It is the only 'Education' building that doesn't have a slider) and the fact it doesn't report usage can become a problem in larger cities. When over capacity, the Opera House will give off a massive education penalty and drop local land values. This issue was fixed by Toroca, a link is available in the Infobox. Maxis made it inherit the Parks Cohort, resulting in it appearing in the Parks and Recreation Finance Panel instead of the Education Finance Panel. Why they did this is unknown, however it may be a result of not including a funding slider.